I wish for you to feel hope, always. I love wire art and if you want to get me a gift, you will never go wrong with this one! 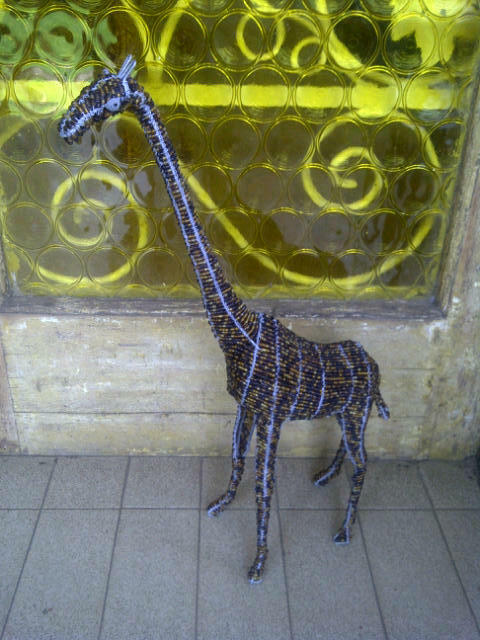 I love giraffe’s and this was a birthday gift from my very loving, loyal and caring friend from the x club, Adele. I love her. I finally washed that grey right out of my hair! I enquired about prices of having your hair coloured at a salon and think I will stick to doing it myself as I have done since I was 14. I am determined this will be a good and happy week. Two male gender kids of mine is testing my patience. We had a lovely supper of mashed potato, fillet, carrots, beans and spinach and ate outside. Next Article How long can you live in the same house before you redecorate? I too think that salons are too expensive with coloring hair. That is also why I do it myself. I coloured my hair myself for many, many years. I’ve found a divine hairdresser here in my little dorpie and for a wash, cut, blow and colour she charges R330 which i don’t think is too bad? or is it? Love fillet with mash. yum yum yum. Supper was awesome ….. Thanks.